Albatross owes its existence to the realization in the mid-1800s that fisheries were being over-exploited in the virtual absence of detailed information about fish populations or the oceans in general. The United States created the U.S. Fish Commission in 1871, headed by Spencer Fullerton Baird, who was also at the time leading the Smithsonian Institution. Baird convinced Congress that the nation needed a state-of-the-art fisheries research vessel that could find new stocks of fish, especially in the deep waters off the northeastern Atlantic coast. Scientific surveys had typically relied on old vessels re-purposed from their primary use as fishing boats or patrol ships to scientific research. Baird imagined something different—a large ship, powerful enough to haul nets suspended thousands of feet below the surface, outfitted with laboratories and storage facilities for biological specimens and sporting the latest in technology (like electric lights). Albatross was 234 feet long, carried a crew of 60 plus the scientific staff and could cover 3200 miles in a single voyage. It carried two massive dredging engines capable of managing more than 24,000 feet of metal towing cable. The ship was used first in the north Atlantic, where it conducted repeated hydrologic and biological surveys at thousands of established stations in both shallow and deep water. It was later deployed into the Gulf of Mexico and then the Pacific, conducting cruises from Alaska to the Galapagos to Cape Horn. Twice—during the Spanish-American War and World War 1—the ship was diverted to wartime uses. 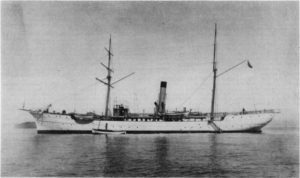 From 1907-1910, Albatross conducted an extended survey of the waters of the Philippines, recently acquired from the Spanish. That expedition became the second most extensive in the nation’s history, for area covered and time spent. As many as 100,000 fish specimens were collected. Scientific study of the collections continues to this day. Allard, Dean C. 1999. The Origins and Early History of the Steamer Albatross, 1880-1887. Marine Fisheries Review 6(4):1-21. Anonymous. 1999. The U.S. Fish Commission Steamer Albatross: A History. Marine Fisheries Review 6(4):i-vii. Smith, David G. and Jeffrey T. Williams. 1999. The Great Albatross Philippine Expedition and Its Fishes. Marine Fisheries Review 6(4):31-41. Smithsonian Institution. Spencer Baird and Ichthyology at the Smithsonian. Available at: http://vertebrates.si.edu/fishes/ichthyology_history/fish_commission.html. Accessed October 19, 2017.